Note: Winner of the Norfolk Stakes, he was 4th in the Breeders' Cup Juvenile by 8 1/2 lengths but came back in December to win the Hollywood Futurity. Was an impressive winner in the San Rafael over Stevie Wonderboy for his first start of 2006. 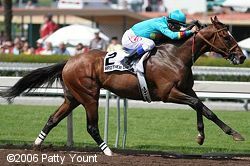 Continued to cement his place as Kentucky Derby favorite with an equally impressive win in the Santa Catalina last out. Led the whole way to win by 3 1/4 lengths in the Santa Anita Derby. Made up some ground in the Derby after having to steady twice and finished in a dead heat for 4th with Jazil. Was cut off and had to steady early in the Preakness when Barbaro backed into him after he broke down but still managed to finish 4th.